Altough video functionality on Digital SLR’s has been with us for a while now, many photographers were initially sceptical of it’s usefulness. However over the last number of years DSLR‘s have gained more ground and are being used by everyone from big budget productions like, House and The Tudors, to a generation of youtubers and vimeo users. While many of us have yet to dip our toes into any form of video production, those of us that have are often surprised by the attention to detail and intricate nuances that good production value requires. Here are a few tips on how to get the most out of making videos on your DSLR camera, so you can avoid some of the common pitfalls that many novices coming from photography to film production often encounter. The best way to approach video shooting is to have the mantra – “similar but different”. Like with photography, get as much as possible right at point of shoot, this includes things that we often take for granted like, white balance and level horizons. These can be difficult to fix in post production. One of the first things to be done is to set the correct frame rate. The higher the frame rate the smoother your video will look. Set your camera to 24 FPS (frames per second) for a movie look, or 30 FPS for an HD look. As photographers we often have the luxury of changing information and cropping areas out in post production. Unfortunately this is not really an option with video without severely compromising the video quality. Make sure to double check your settings before you begin. Video and photography share many of the same principals; however they differ in areas like ISO and shutter speed. If you are filming handheld, make sure you keep your shutter speed double your frame rate as a rule of thumb. For example if shooting at 30fsp =1/60th of a second. When moving around your camera will try to live focus and while this technology has improved in recent years, it is still a long way off perfect. Focus tracking will often go for a walk while filming busy scences so be sure to pop your camera into manual focus. If you are serious about using your DSLR video function then take a look at ‘Magic Latern’. It will open up the firmware in your camera and will allow you many more options than your camera came with. Be warned however, this is open source firmware and loading it will void your warranty. If shooting a video handheld, your camera will record every bump, shake and rattle your hand makes. Invest in a good tripod or monopod and use it. If you are doing a little bit more than some impromtu filming at an event, like making a short youtube video, then have a look a making a ’story board’. This means making some simple drawings of shoots, like a childs story book, so your scences make logical sense to your viewer. This is where it all comes together. Final Cut, Premiere Pro and Avid are all common post production packages in the industry. If only dabbling in the area then consider looking at, iPhoto, Serif Video, Windows Movie Maker or even Picasa. Your storyboard will be an invaluable tool when editing. 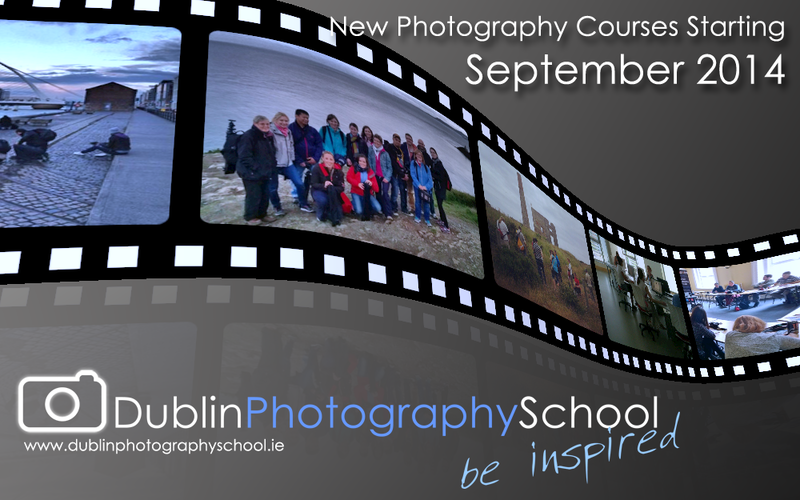 Dublin Photography School Will be introducing a DSLR Video Course in Dublin In Late Summer 2015, And will teach beginners how to shoot better videos with there dslr cameras and will include techniques such as zooming, panning, pull focus, prefocus, framerates etc so keep an eye out. Travel Photography Course in Dublin. Dublin Photography School are hoping to announce a new Travel Photography Course in the last week of September, this course will take place in Dublin and will be aimed at all users and levels. The Travel Photography Workshop is looking like it will take place in a one day format and will be run on Saturdays throughout the year. This section of the travel Photography Course deals with things like shutter priority, aperture priority, P mode, and how to shoot, how to compose travel shots, what to look for, how to photograph street portraits, reportage, documentary, setting a theme, shooting landmarks, getting off the beaten track and how to really get away from cliché shots and give your images more of a travel feel than a tourist feel. This section will make up the bulk of the day and will really show you how to get so much more from your images while travelling. Please note that the travel photography workshop has not been finalized and will be announced in the last week in September, when it is finalized you can book the Travel Photography course in Dublin here. Thanks for taking the time to have a read, any suggestions or comments please feel free to add them below, it’s always great to have feedback. A little about Dublin Photography School: Dublin photography school are one of Ireland’s leading photography course providers, we run photography courses and workshops all over Dublin and Ireland. Our trainers are all professional photographers and more importantly “trainers” we pride ourselves on our teaching abilities, we can cater for all levels, beginners, novice, improver, intermediate and advanced. We are specialists in teaching Basic and introduction to DSLR photography and currently work with Travel Department in providing photography holidays in Ireland and Abroad. See more about us here.